Alkalising colonic irrigation with bicarbonate of soda and high strength probiotic implants and comprehensive consultation at the Parkland Natural Health. High Strength Probiotic Implants provide a complex of friendly bacteria which live in a normal healthy gut. Ideal after a course of anti-biotics or a change of diet or water. i.e. during a foreign holiday. Over 30 billion good bacteria (at time of manufacture): L.acidophilus 45% s.Thermophilus 10% B.Bifidum 6% B.Longum 3% L.Rhamnosus 25% L.Plantarum 7% L.bulgaricus 3% L.Salivarius 1%. 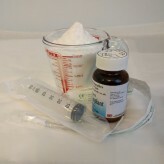 Sodium bicarbonate delivered to the colon through colonic irrigation can kill off candida.